We've taken this journey together and now it's zero hour. In general terms, this is when a military or any other important operation is primed to begin. At some point, a prolific writer will decide whether to take what he/she does as a hobby and turn it into a career. I must admit that because of the full-time job I held, I looked at writing as a wonderful pastime and approached it as a hobby. Over the years, my vision has slowly shifted and with more than a dozen books on the market, my writing has turned into something of a mini-career. I also write and edit non-fiction and these secondary pursuits have come through my love of fiction writing and now pay a major part of the bills. When you take the decision to make writing a career, you must approach your goal with determination and zest. Both these qualities will help you stay on course to becoming the writer you want to be. There are a host of things we learn on the journey and in this craft, we never stop acquiring new skills as the world of publishing changes. These days the average writer has to be publicist and marketing guru alongside the main task of adding to his/her word count every day. Considering how the world of publishing has shifted, the writing world is your oyster. With a realistic plan and measurable goals, the rich landscape of avid readers is yours to explore and carve out a niche for your brand of storytelling or expertise. All the best on the journey! I leave with you three gifts below. Congratulations on completing the Challenge! It's been a blast. Look out for the Linky list for the Reflections Post, which will be up from May 4th to May 8th. You will be asked to add the link that leads directly to your Reflections Post and not the URL to your blog. The journey is indeed the goal. And my journey has gone far beyond anything I could've ever imagined. We make little steps to make it, positive reinforcements. "Z" we made it... thank you! Ahhh Monday the 4th, looked the other day, as I've continued to write and schedule posts and wondered when it was. Will have to go back and change a date of one already written I think. The journey of the challenge seemed a little better this year. Congrats to all who finished. Fantastic tips throughout your posts. Congrats on a great Challenge. And one thing about this challenge is that the journey always treats me well. I love learning new things from all these wonderful bloggers--that would include one from Jamaica. Congrats on another journey well done! I love that quote by Nika Stewart! I really committed myself to my writing about two years ago and I started having some real success then. Zero hour was then. I've always consider writing an endless journey, but at least A-Z has a definitive end point. I wish I had committed to writing much sooner. The other night I was contemplating what I wanted to do with my writing. I have a job, so I have the luxury of being able to take my time making the decision. Good reminder about the Reflections post. I'll have to go for the 5th, I think, since I long ago gave away the 4th to a tour. I made my writing professional, rather than hobby, without any expectation of having it be financially adequate. I'm not sure if that makes sense--just that I try (and succeed maybe half the time) to approach it as a job. Thanks for all of your inspiring posts! You had a great theme and have given me much to ponder. I've been told for years by countless people, "You should write a book." I've been thinking about it and I've started two. Your posts and your story have given me the courage to take these projects further and to bring them to fruition. I'm sure I'll be coming back for more inspiration. Congrats on getting to the end. Thanks for all your hard work in cohosting! As an up and wishful writer, it pays huge dividends to read all of the knowledge that you and experienced writers share on these pages. Thank you for your wisdom and your truth. I've enjoyed your A to Z theme, thanks for all the great advice for writers! I started a book a few years back. But it was so realistic my hubby was mortified. The readers I let in on it were astounded, enthralled and begging for more. But I am content to blog for my own pleasure and let my precious hubby sleep peacefully. Very interesting take JL! Yes, it is finally zero hour and what a relief! Congrats for finishing it all! I see you are a very prolific writer. Well done Ma'am! Keep it going! 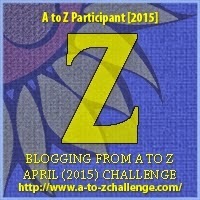 You've had some great posts in the A to Z! I love the word zest. And gusto! It's exciting to be excited by our writing. Congrats on finishing the challenge! I learned quite a lot. Not sure if I'll post a reflection, I'm so far behind on everything in my life right now.